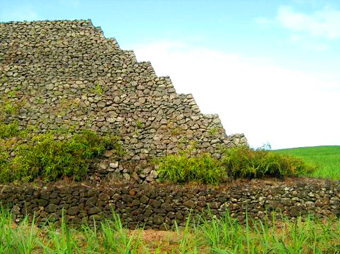 Antoine Gigal reports on the discovery of massive walls, hydraulic systems and road systems on the island of Mauritius, which are connected with the pyramid complexes that have been rediscovered there in recent months. It highlights that this area of the island once hosted a civilisation worthy of that name. 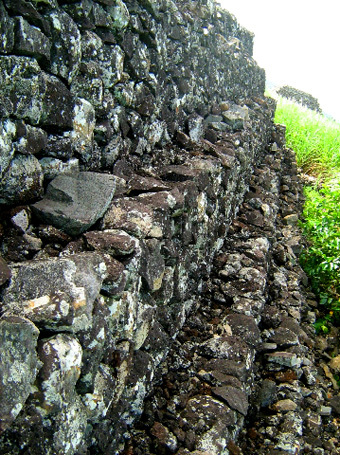 Enormous stone walls, as well as an ancient road network, which was paved and elevated in certain sections; promontory platforms with impressive ramps in front of the ocean; a hydraulic system with terraces; all of these things are of the same era and design of the pyramids, which my team has identified on the island of Mauritius. And that is not all: there are also worked caves with their axes aligned identically north-south, and shaped rocks overlooking the ocean. Since all these structures are in the same general area of the seven pyramids that have been discovered on the island, it is reasonable to conclude that everything was probably built by the same civilisation – and that this was done a long time ago. 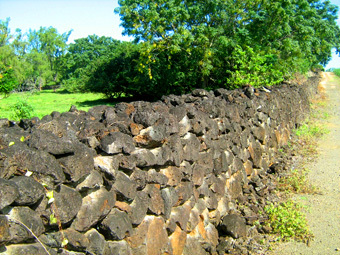 Huge wall at Pont Naturel built in the same manner as the pyramids. 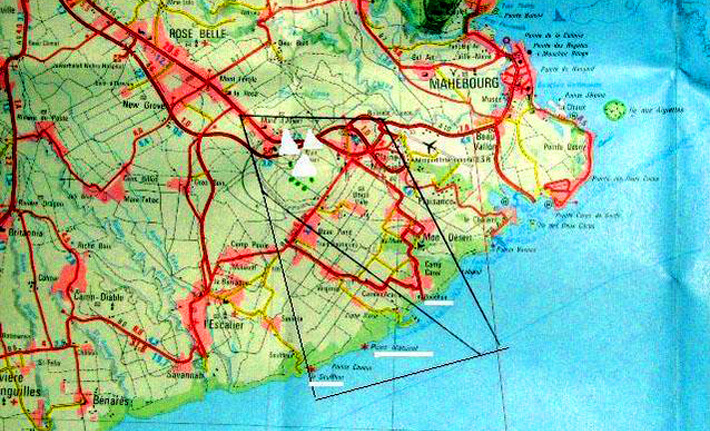 The rectangle indicates the area studied: at the top the pyramid sites, at the bottom the Souffleur and the Pont Naturel at Le Bouchon beach. 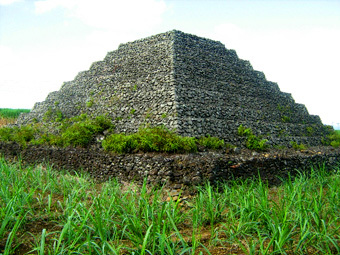 As for the structure of the pyramids on this island off the coast of Africa, they are platform pyramids made of volcanic rock with other stones worked into them, similar in design and size to the pyramids on Tenerife, in the Canary Islands. All the pyramids have, or had, signs saying ‘Protected by National Monument Fund’, which indicated that at one point they were all listed national monuments, and protected as such. Rightfully so, for their construction is clearly the work of man, and required great knowledge and workmanship. The corners of the structures are exact, the bases flat, and irregularities in the terrain were worked into the design to create a stable structure. Corner of pyramid No. 4 Raised base of the corner of the pyramid to compensate for the very uneven ground (seen from the top). 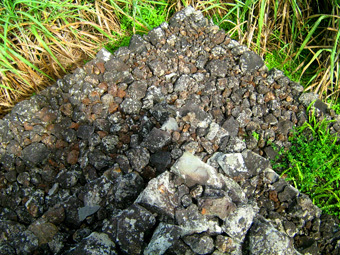 It goes without saying that the theory that these are merely heaps of stones is totally absurd, especially when you show them to geologists and engineers. For one thing the precision of the corner angles of these monuments seen from space is unmistakable, and there is no way this could be the work of slaves clearing useless stones from the fields and heaping them up, even artistically. The precision of the corners and bases, and the allowances made for the sometimes uneven ground, demand calculations and execution by experienced architects. For another thing, why put 7 pyramids in one field? Certainly not to maintain the humidity in the fields, as one sometimes hears people say! 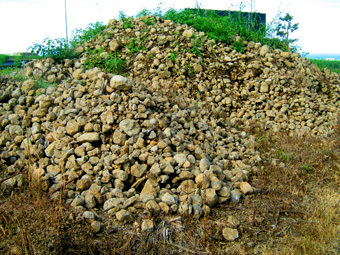 And certainly not to get rid of stones that were in the way, which could simply have been thrown into some of the caves that have been rediscovered. 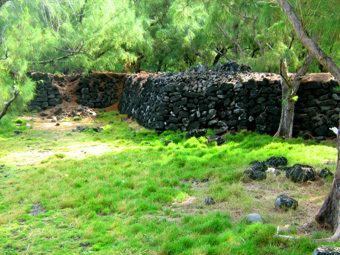 Piles of stones common in Mauritius. Walls built in the same way as the pyramids without mortar, and winding through the countryside without any logic, sometimes right in the middle of the fields. 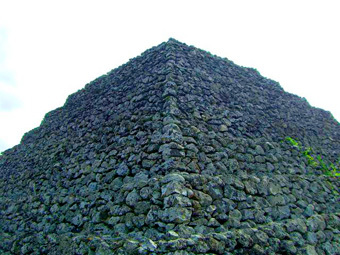 In the vicinity of these seven pyramids, in a zone that is about two square kilometres in size, near the villages of Plaine Magnien, the cemetery and Mahebourg, there are massive rock walls, constructed with the same techniques and from the same material as the pyramids. Pyramid 2, in the background pyramid 1. You can see the significant fall of the land. 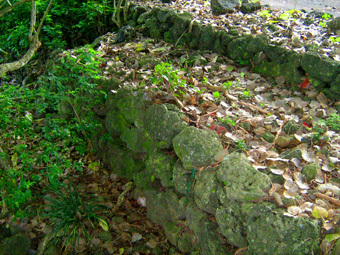 The slope of the walls resembles the inclination of the terraces of the pyramids. Their method of construction is identical. They are therefore not basic structures to delineate fields, but part and parcel of an older construction, with which modern farmers and inhabitants had to live – or get rid off. Angle. 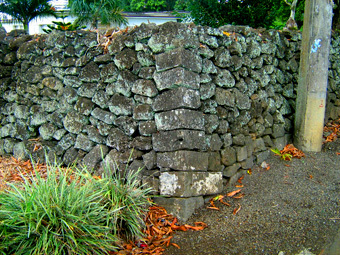 Angle of wall similar to the pyramids and double wall angle in the middle of a populated area without stopping suddenly doubt "erased" by modern civilization and time. 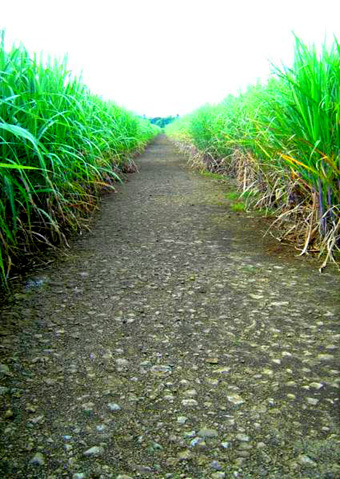 There are also paved roadways that connect the pyramids to other remarkable structures. The roads are perfectly flat and of such design that the trucks that use them every day cause little damage. 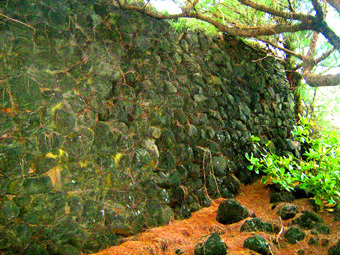 The ancient walls are sometimes doubled to offset angles and slopes. Again, the same building techniques seen in the pyramids are in evidence here. The construction creates a large, flat promontory overlooking the ocean. The site would have been ideal for observation as in ancient times the sun would have risen just in front of this platform. 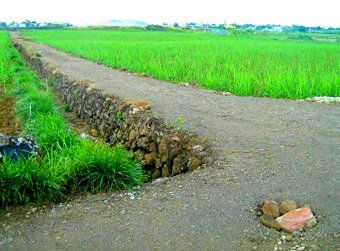 Roadway with a perfect surface near the pyramids. To the north-east of this serpentine platform are two further walls at shore level, going into the sea. 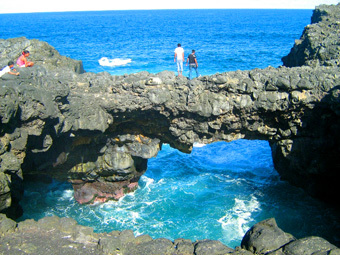 Seventy metres from the platform is the Pont Naturel (‘natural bridge’), which has a double arch on a massive central pillar, again made of volcanic stone, and oriented towards the sunrise. Beneath it the power of the ocean currents creates waves more than thirty metres high. The suction creates pressure on the air in nearby cavities in the cliff, which escapes through a hole in the top of each arch and thus makes powerful sounds. At least one of the holes seems to have been engineered, as it is perfectly rectangular. 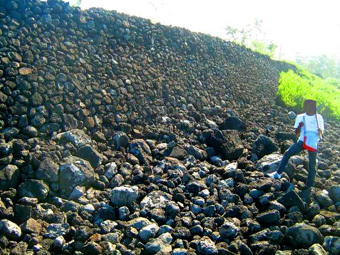 Walls of the main basin of the same material as the pyramids and dug into the hill. 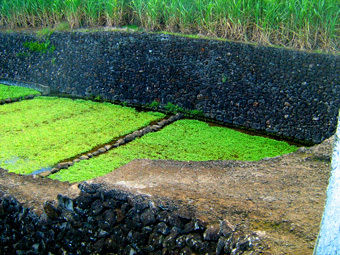 1.5 km south, on a site known as “Le Souffleur”, there is a rocky platform that is twenty metres in height, connected to the land by a small bridge. There is a hole there which, under the pressure of the ocean, becomes a geyser, which can shoot as high as 40 metres, creating a loud sound as the sea is agitated; the sound is like breathing, as if someone is angry. But when looked upon from above, this rock has exactly the same shape as the “serpent ramp” further north. Top of the serpentine wall which winds towards the cliff. It becomes higher and higher until it reaches the top of the cliff. Nearby, we come across similar structures once again. One is situated in the Plaine Magnien, which is partially submerged. The second is somewhat more to the north, and is entirely submerged. 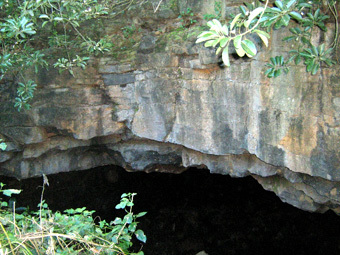 A third one is 4 kilometres to the south, and named “The Cave of the Swallows”, which can be entered for ca. 70 metres before rocks and animal remains block further progress. The three cavities have a monumental entrance, and their interior is immense. 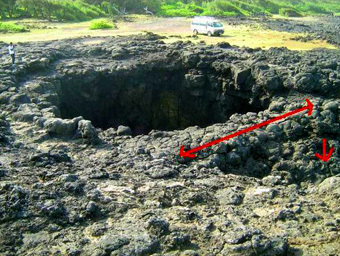 In fact, their interior seems to have been worked by humans, and are not just the remains of lava flows. An initial exploration of the system was done by two French speleologists, François Billon and Philippe Chojnacki, and their report was published in 1993. At the time, it was proposed to form a committee, which would continue the exploration of the system, but this suggestion was never followed up. It is sad to see that since, the state of the caverns has deteriorated considerably. The huge wall becomes much higher just before reaching the cliff. 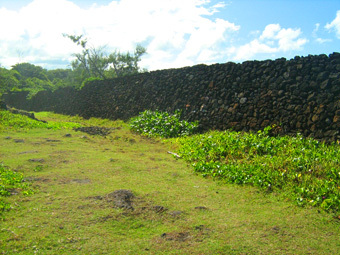 Another giant wall leading to the sea below. Finally, let us return to the pyramids. At 50 metres from Pyramid 2, there is access to a terrace that leads to a square enclosure, made from the same material as the pyramids, with at its centre a small sarcophagus, modern in style, and made from cement. 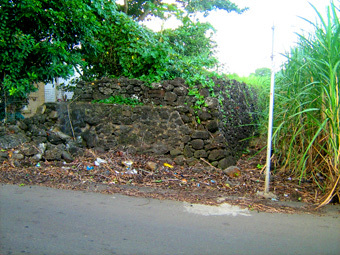 Locals will tell you that it is the tomb of a Mr. Kissoon. It is too bad this man has departed to pastures new, for he could have shed some light as to why he wanted to be buried just here. 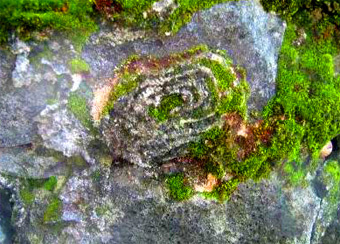 Interestingly, on one of the walls there is an ancient carving in the form of a labyrinth made up of concentric circles, symbols that can be seen in numerous places in Pont Naturel. 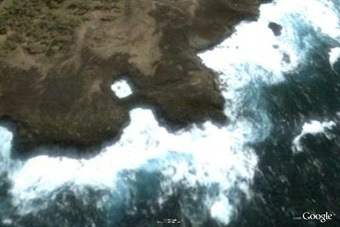 Pont Naturel seen from a satellite, showing the hole and its geometric appearance. Pont Naturel seems to have been flattened. 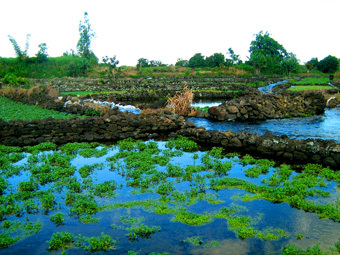 All of these structures offer fabulous opportunities to the people of Mauritius and visitors to make contact with their past. 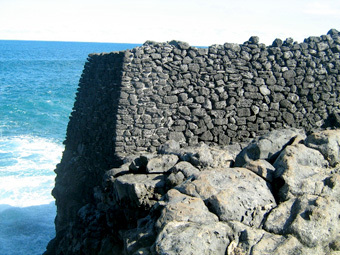 It can lead to extraordinary revelations, not only about the island, but about its connections to similar structures on Tenerife and Sicily, as described elsewhere. With each new discovery, new questions arise. But they suggest that Mankind has been travelling far more, far more widely and much earlier than previously thought. The hole in Pont Naturel. The horizontal arrow indicates the top of the bridge and the vertical arrow points to the sea below. The double edges of the hole appear to be worked by the hand of man, as does the top of the bridge. 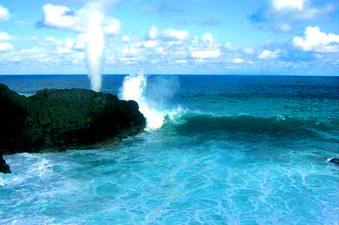 The blowhole in the head of the serpent at Le Souffleur spouting its column of water. 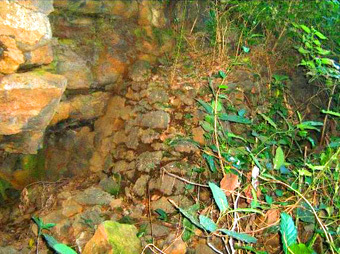 Entrance to the cave and a very old rounded wall that ends just at the edge of it. 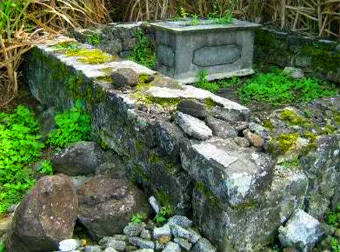 Tomb of Mr Kisoon in the enclosure and carved stone.